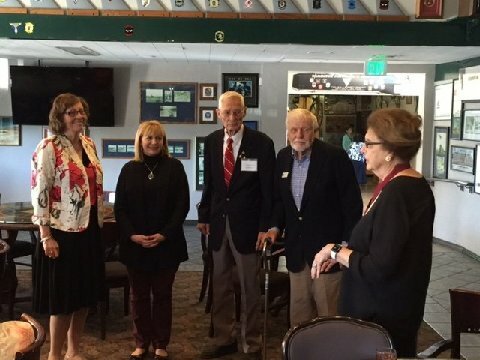 We met May 21, 2016 at the Officers’ Club at Miramar Marine Corps Air Station, San Diego for a joint meeting with the Mayflower Descendants of San Diego. Our program was a presentation of a history of the flags of the United States by the National Sojourners. About 70 attended, including seven Stephen Hopkins descendants who are eligible for both societies. Following lunch, we adjourned for our 2016 Annual Meeting. Because Governor Donna Derrick, immediate past Governor and Councilor Ginny Gotlieb, Historian Scarlett Stahl and Julie Plemmons were in Williamsburg for the Society’s spring meetings, Martha Gresham, organizing Governor, presided and called our meeting to order at 1:35 PM. Seventeen persons were in attendance, including three guests. New members Jim Shepherd and Robert Holcombe were introduced and each briefly discussed his lineage. “I am very sorry not to be with you today as we elect new Officers and hear reports from activities of this past year. I want to thank each of you for making this a successful year for our First California Company of the Jamestowne Society. “We have completed all that has been asked of us by our National Headquarters and even more. “One of our most important efforts has been to oppose the application of Dominion Power Company to the U S Army Corps of Engineers to place 300’ electric towers across the James River. Some of these towers will have red blinking lights 24/7 that will be visible from Jamestowne Island and the Colonial Parkway between Williamsburg and Jamestowne Island. We were invited to become a ‘Consulting Party’ by the Corps of Engineers who must approve the permit to build these towers. Our efforts have been led by Jim McCall who has written many letters and participated in conference calls. “I feel partially due to our presence and pressure, Jamestowne Society finally came out against these lines within the past year. Again Jim helped draft their presentation at the public forum held last fall. “I think we can be proud of our Company for taking an early stand against these visible power lines that evidenced national interest in this issue. I hope we will continue to urge the power company to use other methods to take power lines across the James River in view of our historic Jamestowne Island. “We have welcomed 7 new members this past year. To them I say that we are proud and pleased to have you as a member of our Company, and appreciate the effort you have put forth to complete your paperwork. “To our members of longer standing, your support of our Company means everything and you are what has made this Company a success. What the newer members may not know is that for several years, we were the only Company in the entire state of California. Then about three or four years ago, new companies were formed in northern California and the Santa Barbara area. These two new companies really ate into our membership but we have re-built with new members and renewed interest in Jamestowne, the first English speaking settlement in this new world. Treasurer Suzy Leif presented her 2015-16 financial report and budget for 2016-17. Chaire Murphy gave the Chaplain’s report. Jim McCall reported on the status of the effort to encourage the US Army Corps of Engineers to deny Dominion Power’s permit application. We are awaiting further word from USACE. He emphasized that we were just one of seventeen Consulting Parties that were advising the Corps, which include the National Park Service, National Trust for Historic Preservation and Preservation Virginia. 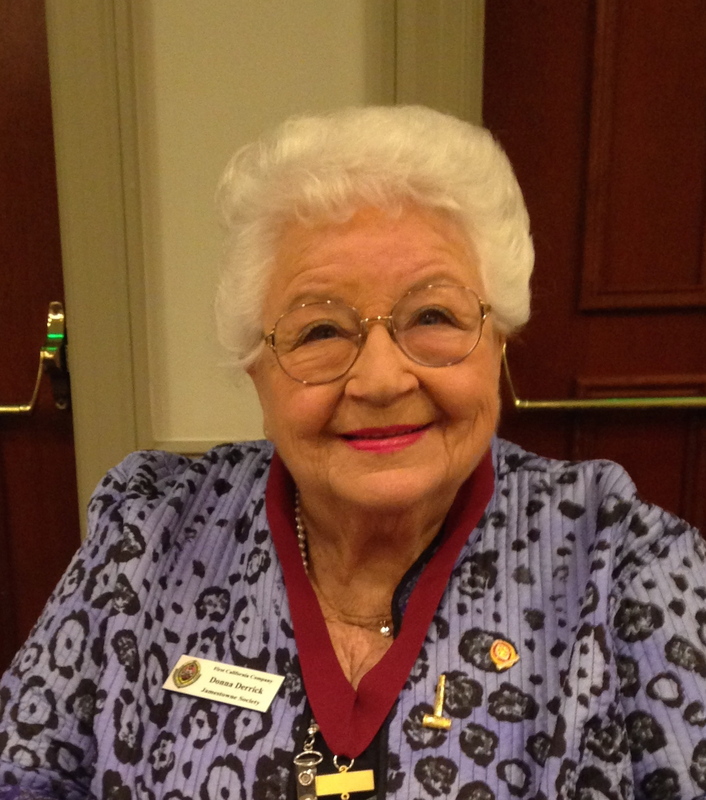 Mrs. Gresham noted that the Genealogical Jamboree is to be held at the Burbank Marriott June 3rd, 4th and 5th. Scarlett Stahl and Sandy and Scott Krutilek will be managing our table, and our brochures will again be in the bags of all registrants, estimated at 1,500. 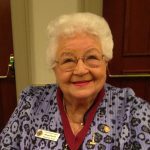 This entry was posted in 2016 Annual Meeting and Elections, Donna Derrick, Elections, First California Company, geneaology, Gotlieb, Jamestowne Society, Membership, New Members, News, Officers and councilors, Scarlett Stahl, SoCal Genealogical Jamboree, Stephen Hopkins, Updates. Bookmark the permalink.